O Lord Jesus Christ our God, Who residest with us in this life, and Who gavest mankind the world, and in Thine inalienable rule dost give to the true the gift of the Holy Spirit, this blessing Thou hast sent down more fully to Thy pupils and Apostles and dispensed into their mouths the fire of tongues, so that through them all mankind would receive knowledge of God and be enlightened by the light of the Spirit, being emancipated from seduction as from darkness and by their supernatural action learning to believe in the Son of God and to praise Him with the Father and the Holy Spirit as one Godhead, Power and Authority. Wherefore, O Splendor of the Father, the Likeness of his Essence, His immutable and unchangeable Nature, Thou art the fountain of salvation and grace. Open my lips, sinner that I am, and teach me how and for what I should pray; for Thou dost know the multitude of my sins, but Thine unbounded compassion doth overcome the enormity thereof. Behold, I come and stand before Thee in fear and dismay, casting my soul’s despair into the depth of Thy mercy. Ordain my life, O Thou Who rulest the whole creation with ineffable wisdom. O tranquil Haven to those who are caught in the rages of winter, make known to me the way in which I should walk. Grant to my thoughts the spirit of Thy wisdom, and bestow upon my ignorance the spirit of Thy understanding. Overshadow mine acts with the spirit of Thy fear; a just spirit renew Thou within me, and by Thy Sovereign Spirit strengthen Thou mine unstable mind, that I may be worthy each day to do Thy commandments, being guided by Thy righteous Spirit into that which is profitable, ever mindful of Thy glorified (second) Coming, when we shall all be obliged to give an answer for our deeds. Let me not be led astray by the corrupting pleasures of this world, but strengthen me to delight in the treasures to come. For Thou, O Master, didst say, “Whatever ye ask in My Name ye shall receive” from God the Father co-eternal with Thee. Therefore, I a sinner, implore Thy goodness on the day of the descent of Thy Holy Spirit. Grant Thou my request for salvation: yea, good Lord, Who grantest all riches and benevolence; for Thou art He, the merciful and pitying, Who givest us more than we ask, Who hast become a Partaker with us in the flesh without sin. Thou art He Who, for his love for mankind, dost have compassion for those who bend the knee to Thee, having become an offering for our sins. Grant, Lord, Thy compassion to Thy people, and incline Thine ear to us from Thy Holy heaven; sanctify us by the saving might of Thy right hand. Cover us with the shelter of Thy wings and turn not away from the product of Thy hands. Against Thee only do we sin, yet Thee only do we serve. We know not how to bow to a strange god, nor how to reach out to a different god. Pardon our iniquities, O Master, and accepting our requests on bended knee, extend to us all a helping hand, and accept the prayers of all as fragrant incense acceptable to Thy most righteous Kingdom. Lord, Lord, Thou Who hast delivered us from every arrow (obstacle) that comes by day, save us from everything that walketh in darkness, and accept the lifting up of our hands as an evening offering. Consider us worthy to pass the night blamelessly and experience no evil. Deliver us from Satan. Free us from all confusion and fear. Grant our souls rapture, and our thoughts concern over our accountability at Thy just and terrible judgment. Transfix our flesh with Thy fear, and mitigate our members who are on earth, that in the tranquillity of sleep we may be enlightened by the meditation of Thy precepts. Drive from us every evil fancy and lasciviousness. Elevate us during our prayers, strengthened in faith and enriched by Thy commandments. O Christ our God, the ever-flowing Spring, life-giving, illuminating, creative Power, co-eternal with the Father, Who didst divinely achieve the deed of saving mankind, and didst tear apart the indestructible bonds of death, break asunder the bolts of Hades, and tread down the multitude of evil spirits, offering Thyself as a blameless Sacrifice and offering us Thy pure, spotless and sinless body: Who, by this fearsome, inscrutable divine service didst grant us life everlasting, O Thou Who didst descend into Hades, and demolish the eternal bars, revealing an ascent to those who were in the lower abode; Who with the lure of divine wisdom didst entice the dragon, the head of subtle evil and with Thy boundless power bound him in abysmal hell, in inextinguishable fire, and extreme darkness. O Great Wisdom of the despairing! Overcomer of misfortunes – eminent helper, Who came and lit the way for those who sit in darkness and in the shadow of death; Thou art the Lord of everlasting glory, the beloved Son of the Most High Father, eternal Light of eternal Light, Thou Sun of truth! Hear Thou us who beseech thee, and lay to rest the souls of Thy servants, of those who have died heretofore, and those of our fathers and brothers and other kinsmen in flesh and all others through faith, for whom we now celebrate this memorial; for Thou hast power over all, and in Thy hands Thou holdest all the boundaries of the earth. O Almighty Master, God of our fathers, Lord of mercy and Creator of all the races of men, the living and the dead, and of all nature, animate and inanimate, Who appeared and resided here on earth and again departed into the other world, Who settest the years for the living and appointest the time for the dead, Who bringest down to Hades and raisest to bliss; who bindest with weakness and loosest with power; Who arrangest the present as is meet and Who directest the future towards usefulness, Who consolest with the hope of resurrection those who feel the sting of death 3/4 Thou art the Master of all, our God and our Savior, O Hope of all the boundaries of the earth and of those who are away on the seas, O Thou who on this last and great day of salvation, the day of the Feast of Pentecost, hast revealed to us the mystery of the Holy Trinity, consubstantial and co-eternal, indivisible and immiscible, Who didst send down the Holy and life-giving Spirit in the form of tongues of fire on His holy Apostles, revealing them as proclaimers of our godfearing faith, making of them true confessors and preachers of the word of God, Who makest us worthy that our propitiatory prayers, of this all-perfect day of salvation, be acceptable for those who are imprisoned in Hades, and Who grantest those imprisoned therein a great hope in receiving from Thee consolation and relief of their confining grief. Hear us, disconsolate and wretched, who beseech Thee, and give rest unto the souls who have formerly departed, and make them to repose in a resplendent place, a place of verdure and coolness, where there are no ills nor sorrow nor sighs. And array their souls in the tabernacles of the righteous, and make them worthy of peace and repose; for it is not the dead who praise Thee, O Lord, nor do those who are in Hades venture to offer unto Thee confession, but we, the living, do bless Thee and supplicate Thee, O Lord, and offer unto Thee prayers of purification and sacrifices for their souls’ sake. O great eternal God, holy and loving toward mankind, Who dost make us worthy to stand at this hour before Thine unapproachable glory, praising and glorifying Thy wonders, forgive us, unworthy sinners, and grant us grace that from a humble and contrite heart we may offer Thee the thrice-holy glorification and gratitude for Thy great gifts which Thou didst grant and dost still steadfastly grant unto us. Remember, Lord, our weakness and destroy us not in our iniquities; but in accordance with our humility show unto us Thy great mercy, that being delivered from the darkness of sin, we may walk in the day of truth, equipped with the armor of light, and freed from all the evil attacks of the wicked one, glorifying Thee in all things, O only true God and Lover of mankind. For in truth, O Master and Creator of all, Thine is the great and original Mystery; the temporary death of Thy creatures, and their restoration thereafter unto eternal repose. In all things we acknowledge Thy favor, at our entrance into this world and at our going out therefrom, O Thou Who by Thy unfailing promises didst hold out to us the hope of everlasting life, resurrection, and incorruptible life, which shall be ours to enjoy at Thy Second Coming; for Thou, Lord Christ, art the fountain of our resurrection, the mankind-loving and incorruptible judge of the deceased and those worthy of reward. Thou hast assumed, with utmost condescension, our flesh and blood, and through Thine undying love for us, didst not dismiss Thy suffering, willingly submitting to torture; so that, having been tempted, Thou, as promised, became the helper to those who are tempted, elevating us to Thy dispassion. Wherefore, O Master, accept our prayers and supplications, and grant repose to our fathers, mothers, brothers, sisters, children, blood relatives, and kinsfolk, and all those who have gone to their final rest with the hope of resurrection and life everlasting. Inscribe their names in the Book of Life; in the bosoms of Abraham, Isaac and Jacob; in the land of the living, the Kingdom of Heaven, in the paradise of delight, leading all into Thy Holy dwelling places by Thy radiant angels, and raise their bodies on the day that Thou hast appointed, according to Thine unfailing Holy promises; for there is no death, O Lord, to Thy departing servants who cast off their bodies and come unto Thee, O God, but a transition from sorrowful things to pleasant and benign, to repose and joy. And if they have sinned (in any respect) against Thee, forgive them, and be Thou compassionate unto them and us; for there is none without stain before Thee, even though his life be but a day, save Thou alone, Jesus Christ our God, Who didst appear on earth without sin, and because of Thee we all trust to attain mercy and the remission of sins. Therefore, O God, through Thy grace and love of mankind, weaken, remit and forgive our sins and theirs; overlook both our voluntary and involuntary offenses, which we have committed either willfully or through ignorance, openly or in secret whether by word, deed, or thought and all our wrathful dealings which we have committed during our lifetime. As for those who have preceded us, grant them emancipation and repose. To those of us who are here, bless us, and give us and all Thy people a blessed and peaceful end to life. At Thy fearsome and dreadful coming open to us Thy fathomless love of mankind, making us worthy of Thy Kingdom. O Thou most exalted God, Who alone dost possess immortality, Who dwellest in the unapproachable light, Who in wisdom didst bring into being all creation, who didst separate between the light and the darkness, setting the sun to rule the day, and the moon and stars to rule the night, Who on this day didst vouchsafe us sinners as worthy through confession to present ourselves before Thy countenance and to offer to Thee our evening prayers. O philanthropic God, set our prayers like incense before Thee, and receive them as a sweet fragrance. Grant that this evening and the approaching night may be peaceful and serene for us. Clothe us with the armor of light, and deliver us from nightly fears and from everything that walketh in darkness. Vouchsafe that the slumber which Thou didst grant us for rest from our weakness be also free from every satanic vision. Yea, O Master, Who providest good things for all, grant that in our lodgings, amid the night, we may with fervor recall Thy most Holy Name. 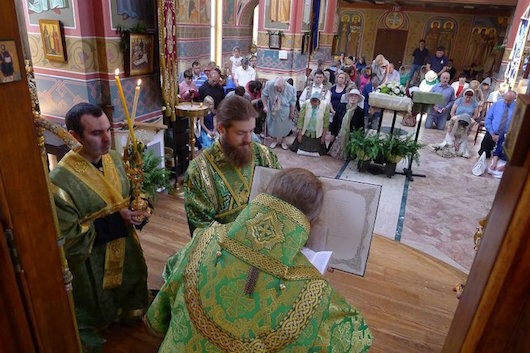 Grant that being enlightened by the teachings of Thy commandments, we in spiritual joy would rise up to glorify Thy goodness, offering for Thy compassion petitions and supplications for our sins and those of all people, for which Thou, through the intercession of the Holy Theotokos, visitest upon us with mercy! Amen.